The Second World War interrupted and cut short the lives of millions of people around the world. The shockwaves of the conflict impacted on all parts of life and football was no exception, with hundreds of professionals being called up to fight and some making the ultimate sacrifice. Petea Valcov is regarded as one of the greatest Romanian football players of all time and was one of Europe’s most potent and prolific strikers during the 1930s. Valcov was born in 1910, in Bolgrad, a small city in the Odessa region of the Ukraine which changed hands a number of times during the late 19th and early 20th centuries and was part of Moldova, Romania and finally the Ukraine. His childhood saw great political upheaval, with the collapse of the Russian Empire and the establishment of the Soviet Union, but Valcov would not live in the communist state and instead saw his hometown join Romania. Here he and his brothers, Colea and Volodea, became one of Romania and Europe’s great attacking trios. The brothers originally signed for Mihai Vitazu Chisinau in 1924 before Venus Burcharest in 1930 where they went on to win a number of Divizia A (Romanian top flight) titles, with Petea winning five between 1931 and 1940. 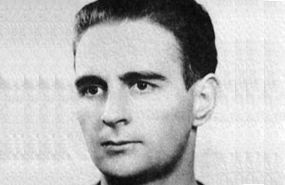 His fine performances were quickly rewarded with a call up to the national side, and Valcov made his debut against Bulgaria in the Balkan Cup in June 1933, scoring a brace in a 7-0 win. He also scored two goals in a 4-2 friendly match defeat against Nazi Germany in 1935. When war broke out in 1939, Romania was fearful of being overrun by Nazi Germany and its democratic government came under pressure from fascist elements within the country’s parliament. In November 1940, Romania was in political disarray and eventually saw the military overthrow the government after a deal was agreed between Horia Sima of the Iron Guard, and career army officer, authoritarian politician and renowned anti-Semite, Ion Antonescu. After pledging their allegiance to Nazi Germany and the Axis powers, Antonescu won the confidence of Adolf Hitler and used his new found strength to eliminate many of his rivals during the Legionary Rebellion of 1941. With his position as dictator secure, Antonescu committed thousands of soldiers to the Axis war effort, with the Romanians making up the single largest contingent of soldiers for the invasion of the Soviet Union, Operation Barbarossa, after the Germans. Valcov was enlisted in the Romanian Army in 1941 and sent to the Eastern front where he and his Romanian brethren were at first part of a string of major victories. Following the German defeat at Stalingrad however, this soon changed, and the order of the day was retreat and eventual defeat. In 1943, while fighting the Red Army at the Kalmyk Steppe near the Caspian Sea, Valcov was killed in action at the age of 33, becoming one of the 370,000 Romanian troops to lose their lives in the conflict. Following intense bombing by the Allies and with the Soviet Union taking nearby territories, King Michael overthrew Ion Antonescu and Romania switched sides. Valcov was survived by his brothers, Volodea, who sadly died from tuberculosis after the war, and Colea, who went on to become an accomplished football manger, bossing a number of Bucharest teams and the national side.